Factual error: Robin and Azeem land at the white cliffs and Robin says something like, 'Tonight we will dine with my father'. Those white cliffs are the Seven Sisters in East Sussex, about 200 miles from Nottingham. It would probably take about two weeks to walk it. They also reach Hadrian's Wall in the next scene, which is 200 miles further north than Nottingham. Factual error: When Marian is embroidering at home, she is singing to herself "Le chant des oiseaux", which Renaissance composer Clement Janequin didn't write until the 16th century. Factual error: Aside from the earlier mentioned mistake of them apparently walking to Nottingham in less than a day, if Azeem was facing Mecca to pray, they set off in a southerly direction anyway. Trivia: There was a series made in the UK (and very popular in many other countries) in the 80's called Robin of Sherwood. One of the characters was a Saracen called Nasir. He was not originally supposed to be one of the regulars, but the actor (Mark Ryan) got on so well with the rest of the cast, the decided not to kill Nasir, but keep him on as one of Robin's men. When Robin Hood Prince of Thieves was in development, a character called Nazeem was written because the writer thought that the Saracen was a traditional part of the legend (along with Little John, Will Scarlet and Marian). The name was changed to Azeem because they found out that the character was unique to Richard Carpenter's Robin of Sherwood. So, thanks to a random piece of casting in the UK in the 80's, we were given Morgan Freeman's Azeem. Trivia: When the villagers are pushing the catapult to the castle so they can get Robin and Azeem inside, the person on the very right of the screen is wearing the same clothes as Will and has the same hair style, but it is definitely not Christian Slater. It is his stunt double. Trivia: There is a close relation between Sean Connery and Robin Hood. 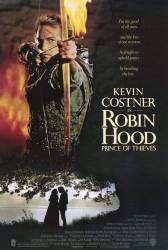 Connery played Robin Hood in the movie "Robin and Marian" in 1976. His son, Jason Connery, played this same character in "Robin of Sherwood," the TV series, in the eighties. And, finally, he had a small part in "Robin Hood: Prince of Thieves" as King Richard. Sheriff of Nottingham: Locksley! I'm gonna cut your heart out with a spoon. Robin Hood: Then it begins. Guy of Gisbourne: Why a spoon, cousin? Why not an axe? Sheriff of Nottingham: Because it's dull, you twit! It'll hurt more! Sheriff of Nottigham: That's it then! Cancel the kitchen scraps for lepers and orphans, no more merciful beheadings, and call off Christmas! Question: Who exactly are the masked cult of which the Sheriff is a member, shown at the beginning when he unmasks and demands that Robin's father join them or die? If memory serves, the cult and the Sheriff's affiliation with them isn't referenced again at any point in the film. I know the Sheriff and the Witch are dark magic practitioners, but that was suggested to be a private thing between them in the bowels of the castle. Chosen answer: The masked men weren't part of a cult, they were the Sheriff's soldiers, the same ones that Robin meets when he first returns home. They are just in hoods and masks to appear intimidating while trying to kill the noblemen, like Locksley. Question: In the scene where Fannie is having trouble giving birth as the baby is breeched, how does Azeem deliver Fannie's baby? Chosen answer: While it is never explicitly shown, it is implied that Azeem performed a Cesarean Section.